Search For "E-Commerce & IT Outsourcing" Companies in Richardson, Texas - Click Here Now! 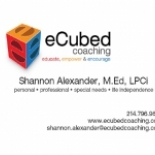 eCubed Coaching And Consulting’s passion Is To Assist Clients In Overcoming Obstacles, Promoting Peak Performance And Potential While Encountering Life’s Transitional Phases. We Educate, Empower And Encourage Clients While Enhancing Organizational, Professional And Personal Success. Collaboratively, We Possess Over 20 Years Experience In Coaching And Consulting Individuals And Diverse Populations, Including: Fortune 500 Companies, Small Businesses, Private Schools, Non-profits And Those With Special Needs And Learning Differences. ECubed Coaching And Consulting in Richardson is a company that specializes in Computer Related Services, Nec. Our records show it was established in Texas.